Apple may not be at Macworld 2010 this week, but the company still managed to announce a new product just in time for the trade show. 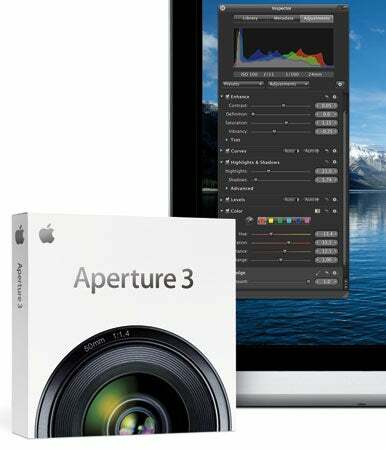 On Tuesday Apple announced Aperture 3, the latest version of the company’s $199 pro-level photo-editing and management software. The update ($99 for existing Aperture users; a free trial will also be available) includes advanced versions of the Faces and Places features previously seen in iPhoto ’09. There’s a new image-refinement tool called Brushes, which allows users to paint adjustments directly on to images. And a new Projects feature adds flexibility. Aperture 3 will run in 64-bit mode on Snow Leopard and 64-bit processors. Paulsen said the Aperture 3 interface “looks more iPhoto-like,” with larger and easier-to-read type and streamlined buttons and sliders. “Everything’s bigger and redesigned,” he said. And iPhoto ’09 users can import their libraries directly into Aperture 3, with all existing Events, Faces, and Places preserved. When iPhoto ’09 was released, Paulsen said, “the Aperture discussion boards lit up, asking when they could see” Faces and Places within Aperture. With Aperture 3, those features have been added—but they’ve also been “extended and enhanced for prosumer photographers—and pros, for that matter,” according to Paulsen. Under the hood, Aperture 3 uses the same face-recognition technology as iPhoto ’09. But Paulsen said that in Aperture the user has more control, such as being able to constrain face-scanning to individual projects—for example, a wedding photographer can limit face scanning to a single event, so that Aperture doesn’t attempt to match the faces in one wedding to the faces in every other photo in his or her library. There’s also an Unnamed Faces View, a film strip on the new Faces Corkboard, which shows all the faces that the program has detected but hasn’t been able to name. The implementation of Places in Aperture 3 “sets a new standard for geotagging for photographs,” Paulsen said. As with iPhoto ’09, there’s a map interface with tiles from Google Maps and reverse-geocoding is performed by Apple’s servers. But Aperture 3’s map is highly interactive, allowing users to drag and drop thumbnails onto the map, move pins if the location’s slightly off, and even import GPX files so that users of GPS logging tools can auto-match an entire set of photos to the GPS data. The program also writes latitude and longitude data back to the photo files’ IPTC data. The new Brushes feature is “probably the most requested feature in Aperture,” Paulsen said. With Brushes, users can now selectively adjust portions of their images, rather than adjusting the entire image. There are 15 Quick Brushes, presets for the most common retouching tasks, such as increasing contrast, polarizing, dodging, burning, and adjusting saturation. But in addition, users can turn adjustments they’ve created in the Inspector window—including the new curves setting—into a brush. Each brush stroke can be turned on or off individually, as the adjustments are entirely non-destructive. And Brushes includes an optional edge-detection feature that analyzes what you’re brushing in real-time and limits adjustments to the area you intended to modify. In addition to book layout, web galleries, and web journals, Aperture now supports uploading to Facebook and Flickr. These features are “pretty much the same as iPhoto,” Paulsen said, though he added that Faces names in a photo can now be added to Flickr as keywords. Aperture 3 boasts a new slideshow engine, which offers the features of iPhoto ’09’s advanced slideshows—but with all the controls opened up. Users can define slide durations and transitions, add text and borders, define multilayered soundtracks, and even add video. (Aperture 3 imports and supports video, offering a trimming interface similar to iPhoto.) Slideshows can then be rendered to video and sent to iTunes, and Aperture 3 supports exporting slideshows in 720p and 1080p formats for display on HDTVs. Aperture 3 offers a new full-screen view, that lets you work on projects, thumbnails, and even the Browser in full-screen view. And there’s a Library Path Navigator feature that allows you “to navigate to any part of your library without leaving full-screen mode,” Paulsen said. Library handling is also improved in Aperture 3. If you’ve got multiple Aperture library files, you can merge them all together in one place. A photographer with a MacBook Pro on a remote photo shoot can start with a fresh library and import it into his or her master library upon returning home. More impressively, Aperture will sync and merge libraries: photographers can export a portion of their libraries to a laptop, take it on the road to do work, and then bring that library back home. Aperture will detect what’s changed and sync only the changes back to the master library. The new version of Aperture runs in 64-bit mode on Snow Leopard, and Paulsen said that’s especially good news for users who have giant files, such as super high-resolution scanned images. Those images can now be loaded into memory, vastly increasing performance. The last major update to Aperture, version 2 ( ), was in February 2008.